The Bookfeast Schools Festival is an annual event held at various interesting and inspiring venues in Oxford. In the past these have included Oxford University Museum of Natural History, Pitt Rivers Museum, the Weston Library, the Ashmolean, The North Wall and the Story Museum. In 2017 we were fortunate enough to move the Festival to St Hugh’s College, Oxford. Taking place over three to four days in May, we aim to offer around 2,000 primary school pupils the opportunity to meet top children’s authors, illustrators and poets. 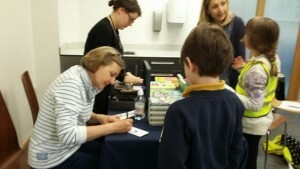 With bookselling managed by Waterstones Oxford, children are able to buy books at the events and have them signed by the author. In addition to the Schools Festival Bookfeast organises a number of one-off author events around the county at other times of the year, ensuring that around another 500 children can listen to and meet authors. The 2018 Bookfeast Schools Festival took place in May at St Hugh’s College, Oxford, with eighteen events over the three days and a wonderful array of top children’s authors and illustrators including Philip Ardagh & Elissa Elwick, Matt Carr, Tracey Corderoy, Elys Dolan, Abi Elphinstone, Claire Fayers, Pip Jones & Adam Stower, Jennifer Killick, Layn Marlow, Tom Percival, Tony de Saulles, Kaye Umansky, Steve Webb and Jeanne Willis. Seventeen Oxfordshire primary schools attended the Festival bringing around 1600 pupils from Foundation stage through to Year 6. The children enjoyed an engaging range of interactive and entertaining sessions which aimed to inspire and encourage their interest in books and reading. Three hundred children took part in an additional exploration trail around the college and its beautiful grounds, finding out about its history and what life is like as a student at Oxford University. BBC Radio Oxford recorded for its Kids’ Book Club during some of the Festival’s events, and Waterstones ran busy book stalls at each venue so that children could buy and get a book signed by the author. We would like to thank the St Hugh’s community for enabling us to host the Bookfeast Schools Festival at the College in May 2017. We greatly appreciated the support of the Principal and key Fellows. The event would not have been possible without the invaluable help of the Conference Office, Thea Crapper, Luke Jackson-Ross, Kate Mellersh and the IT team. 1740 Primary School children came to Festival events, plus 215 accompanying teachers and other adults, between May 16th and May 19th. There were 21 author sessions, with 16 participating authors and illustrators, including Michael Rosen, Piers Torday, Cas Lester, Jo Cotterill, Kiran Millwood Hargrave, Tom Moorhouse and Holly Swain, Pip Jones, Clare Vulliamy and Polly Faber, Laura Wood, Teresa Heapy, Pip Jones, Yasmin Ismail, Gary Northfield and Suzanne Barton. 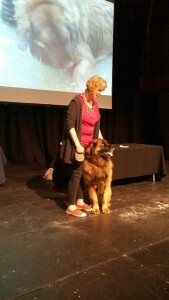 21 schools attended, from all across Oxfordshire. Of these, 20 were state schools. 291 children participated in a trail exploring the College grounds and history. 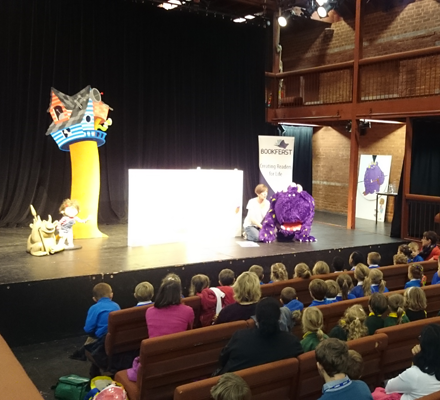 The 2016 Bookfeast Schools Festival was a huge success involving around 1800 pupils from 22 Oxfordshire primary schools. We ran 16 author sessions during Festival week including two Shakespeare Focus events to tie in with Oxford’s own celebrations to mark the death of Shakespeare. In addition, to extend the reach of the Bookfeast Festival, arts organisation Flash of Splendour delivered 5 unique Shakespeare workshops for children in Y5-6 at schools around the county. Around 400 children also took part in additional and enriching experiences after their author sessions – a creative writing trail (Pitt Rivers) and tours of two exhibitions: Animal (Story Museum) and Shakespeare’s Dead (Weston Library). Authors taking part in the Bookfeast Festival in 2016 included: Atinuke, Sarah Courtauld, Julia Golding, Adam & Charlotte Guillain, A.F. Harrold, Cas Lester, Gill Lewis, M.G. Leonard, Christopher Lloyd, Lauren St John, Robin Stevens, Sean Taylor, Sam Watkins, Marcia Williams and Katherine Woodfine. Events varied from ‘sing-alongs’ with pirates to African storytelling, practical sessions on how to write crime fiction and mysteries, and stories featuring talking beetles, Jekyll and Hyde teachers, dragons, unconventional fairies and dogs of all shapes and sizes. One courageous author brought along her own inspiration for her latest series – Murphy the Leonberger (see photos below) who wowed his audience with his passion for sausages and his high fives. Bookfeast would like to thank all the wonderful and inspiring venues for hosting Festival 2016 events: Pitt Rivers Museum, The Story Museum, the Weston Library, the North Wall and the Oxford University Museum of Natural History. These venues add so much to the children’s overall Festival experience, and the authors love visiting them too!